When we mention Virtual Reality (VR), we think of gadgets such as the Oculus Rift and the HTC Vive VR Headsets. Plug it to a computer and immerse yourself into this computer generated reality. With Augmented Reality (AR), we think of mobile applications such as the Pokemon Go. Real world with augmented objects. Pretty cool right? Then there’s Mixed Reality – the Microsoft Hololens head-mounted display is currently on top. But what about Augmented Reality? What is it? Let’s begin by taking a look at the Reality-Virtuality Continuum published by Paul Milgram and Fumio Kishino in 1994. From the RV Continuum, we can see terms such as MR, AR and AV. VR is not added here but it on the Virtual Environment section. Before we discuss AV, let’s briefly discuss the rest first. The term VR involves full immersion in the virtual world. Everything that you see is computer generated. You won’t see the real world at all so mind your shin on that edge of your table! VR has been used for a lot of gaming but has also been helpful with other industrial and medical training. With Google’s ARCore and Apple’s ARKit, AR has been pushed towards mobile applications. It is useful for adding information on physical objects such as for educational interactivity. Zubr have been able to complete more than AR Projects. Currently the term MR is unclear as it can be a confusion with AR. But following the RV continuum, it consists of two terms AR and AV. MR, ultimately, is the combination of both real and virtual objects. Now that we have a brief idea of the different terms, we can talk about what Augmented Reality (AV). AV is similar to AR but it is actually the opposite. Within the virtual world, real world objects are composited on top. With the research project Mixed-Reality Production Solutions, we are essentially creating a real-time AV application under the umbrella term Mixed-Reality. The application is to enhance viewer engagement with the player playing in VR. Wouldn’t it be helpful to actually see what the player is interacting with? Wouldn’t it be helpful to be able to see the VR world from the third person point of view? Hey guys! Allow me tell you a little bit about me. 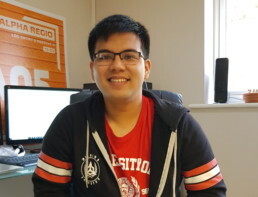 My name is Kenneth Cynric Dasalla, a Research Engineer (RE) with Zubr VR and 2nd year EngD Student with the University of Bath. With just mathematical backgrounds, I challenged myself to try a career that involves problem solving. I have never heard of computer science in high school but with a bit of research, I chose to study it. I have never coded before but I was able to learn it throughout undergrad. I entered with a normal course but I finished with a specialism. I finished the undergraduate degree, BSc Computer Science with Visual Computing, at Cardiff University. During my final year, an email was sent to everyone about an opportunity for a doctoral training scholarship. Not missing out on the opportunity, I gave it a go and one or two months after my graduation, I got the scholarship. I recently just finished the Masters and transitioned into my second year as an EngD Student with the Centre for Digital Entertainment. Where does Zubr VR come with this pot of opportunity? First of of all, the EngD is a doctorate similar to a PhD but with a twist. The structure of my EngD involves 1 year of Masters Taught programme + 3 years of a research project. To make it an Engineering Doctorate, the Research Engineer (that’s me), must be paired with a company during the 3 year research. My status will be a doctoral student but based with the company. Zubr VR (the company I’m with) specialises in Virtual Reality, Augmented Reality and Mixed Reality. The difference with a PhD and an EngD is IMPACT; the finished research will benefit Zubr as well as benefit me in submitting a final thesis (wish me luck!). The title of the research is Mixed Reality Production Solutions. The longer version is Exploring the use of real-time depth camera and compositing technologies in video for mixed-reality production solutions – technologies, workflows, implications for content creation. Zubr has already made a start on this from the previous blog post (https://zubr.co/introducing-zubr-vr-mixed-reality-video-studio/). So it is now my turn to continue with the research and find ways for a better solution or an improvement with their current solution. I am now on my first few weeks with Zubr and already made connections with everyone here. This is actually my first time ever in the industry and it is awesome to see everyone collaborating with their own expertise. I am now settled and it is about time to really begin this research project. Many more updates to follow!